There’s something marvelous about a cleaner that very thoughtfully includes its own brush. Woolite uses the power of oxygen and traditional Woolite formulas to provide you with a safe cleaner for carpets. 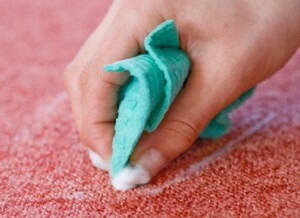 Squeeze the cleaner onto the stain, rub it in with the brush and let it air dry. After you vacuum, most stains will vanish. It can clean red wine and most other stains. The one downside is that it’s best for small areas because it would simply take too long to clean an entire carpet with it. This cleaner is available at auto parts stores because it’s really made for car mats. However, it also works great on home carpets. Simply spray the stain, blot the cleaner and watch the mark vanish. It sells for less than $10, so it’s a very affordable alternative, and you’ll appreciate that there’s no scrubbing required with it. However, you are strongly encouraged to test this in an inconspicuous area to make sure it won’t harm or discolor carpets. Available at large retail stores, this cleaner has been known to remove soda stains that were more than five years old. Customers have reviewed this cleaner and called it amazing, awesome, and shocking. It can be used on automotive and residential carpeting to remove just about anything. Spray it on the stain and then use a towel to blot up the cleaner and the stain. This cleaner has been around for years because it works. It comes in an aerosol can and you just spray it directly on the stain. Use a paper towel to then rub it lightly and blot it up along with the offending marks. Readily available and affordable, OxiClean is a great choice when you’re dealing with large stains. Work the powder into a paste and rub it into the stain. Rinse it away with a sponge, and then use a steam cleaner to capture any residue. This can remove ketchup, mustard, raw eggs, and even chocolate from carpets. There are many excellent solutions available for treating stains, and it’s wise to have a few of them on hand in case of an emergency. However, you may not always have the time to treat carpet stains or clean large areas that are stained. If you are short on time or energy, let High Quality Carpet clean your stained carpets and remove the stains in Bridgewater NJ and beyond. We have special cleaners on hand to restore your carpet, so you can enjoy fresh, clean carpets without any of the extra work.